It is a gray day in Utah today. Although I am quilting a bright quilt (not ready to show yet), a part of me wants to snuggle under a quilt and read a good novel. Not cold enough to light up the fireplace, but still this is what I feel like doing now (before the kids get back from school!). 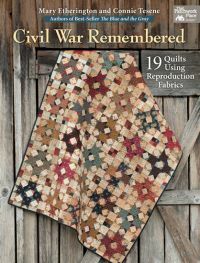 So I am taking a break from quilting for a few minutes to share with you this book I saw the other day: Civil War Remembered by Mary Etherington and Connie Tesene, formerly from Country Threads. All the projects in this book evoke cool afternoons and reading under a quilt! Traditional blocks set in creative designs make me want to finish my current quilting project and start pulling out reproduction fabrics from my stash. The projects in Civil War Remembered are perfect for scraps (these designs would also look great made with other fabrics, too), which we all have drawers and bags full of, right? You will find that the patterns are easy to read with detailed diagrams and instructions. I love that most of Martingale's books now come in eBook format, as I am fresh out of space for paper books!